Hornby R6365 RailRoad Breakdown Train - 20 Ton Brake Van, Crane, LWB Open 00 Gauge Wagon Rolling Stock Usually around £26 so not a bad price. I dug my old train set out of my mum's loft a while ago as I thought my kids might like it. But the track seems to not conduct any more. I think I'll need to buy a new set with track - so if you know any track bargains please give me a heads up. For reference, Sovereigns, half and quarter are all made from 22 carat gold, not just layered. With the present cost of raw gold at £1009 an ounce (28/12/2018) and rising, normal quarter sovs are now going for about the same price as these one offs. 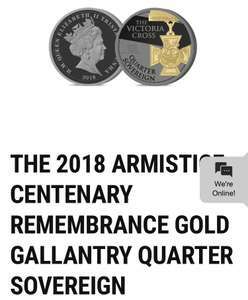 I'm no expert, but I'd imagine that the '22 carat gold' Victoria Cross is applied to the surface of the coin in a microscopically thin layer and not struck through. Cheap little Hornby trainset. Maybe something to run around the xmas tree. I've got this. It's decent for the money. Thanks OP - another Christmas present sorted. Much appreciated!